Lots of it and free! Light rail at I-225. Nine Mile Station. Public buses available on Parker Rd. Our catering services include off site catering for small to very large groups. We have in the past done weddings, entire office buildings and more. We have the capacity to come set up a meal, serve and break it down. We also can simply drop off food for your group. Very reasonably priced menus can be seen at our website or we can customize your menu to fit your needs. We can also do breakfast groups and box lunches if that is what you need. Give us a call and let us know how we can be of service to your next function. Our private banquet room holds groups up to 65 and is available for breakfast, lunch or dinner. We offer a beautiful space to hold an office meeting, a rehearsal dinner, family reunion, birthdays and more. Food served buffet style, family style or plated depending on your needs. Italian cuisine. 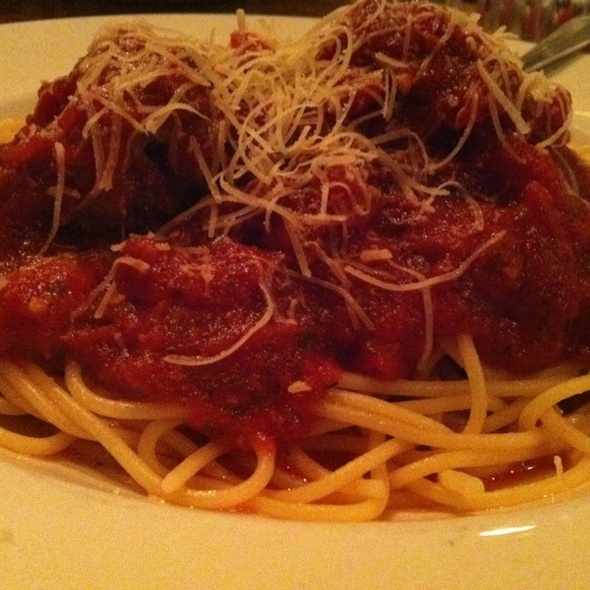 The Bent Noodle Italian Restaurant and Catering Co. is a true neighborhood Italian joint. From the checkered tablecloths to the beautiful aroma of sauteed garlic, you will feel as though you’ve stepped foot into a little slice of Italia. With Dean Martin and Frank Sinatra filling the air with classic tunes, come enjoy some of Denver's finest Italian eats. 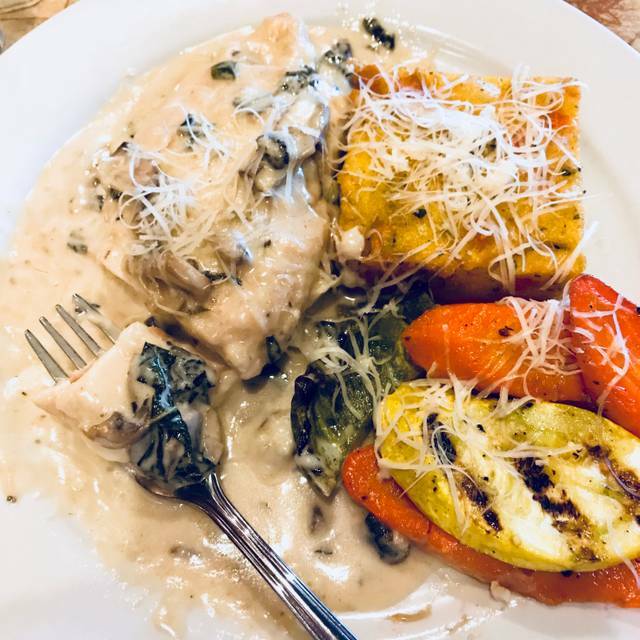 Family owned and operated since its inception in 1996, The Bent Noodle never fails to leave you perfectly stuffed with classics such as Homemade Sausage Lasagna, Fettuccine Alfredo, Chicken Picatta, or Simply Spaghetti and Meatballs. Try our homemade salad dressings, or Sausage and Peppers to start and finish with a piece of our New York style Cheesecake. Serving lunch Monday thru Friday starting at 11 am and dinner every night starting at 4. Happy Hour is Monday thru Thursday 4-6! We look forward to serving you! Homemade italian sausage links, with sauteed peppers and sweet onions. Fresh baked bread topped with parmesan, mozzarella and loads of garlic. Lightly fried calamari tossed with lemon and garlic, served with a spicy tomato sauce and caper mayonnaise. Lightly floured shrimp fried and tossed with garlic, lemon and crushed red pepper, served atop a spicy marinara. Fresh mozzarella, roma tomato and fresh basil with garlic, olive oil and balsamic vinegar. We saute them with fresh herbs and white wine; top with mozzarella and parmesan; then, bake to a golden brown. To die for! Crisp greens tossed with grilled tomato vinaigrette with ripe tomatoes, sweet red onions, feta cheese and parmesan. Mixed garden greens tossed with shredded vegetables, candied pecans and roasted shallot vinaigrette. Our award winning caesar salad, yes we have anchovies (for a small charge). Oven roasted chicken, crumbled gorgonzola, candied pecans and julienne vegetables on a bed of field greens tossed with roast shallot vinaigrette. Mixed greens and romaine tossed with our famous caesar dressing then topped with calamata olives, tomatoes, capers, sweet red onions and feta cheese. If this isn't the best minestrone soup you've ever tasted we want your recipe. P.S. our zuppa has sausage in it. Chicken breast lightly breaded and fried topped with creamy provolone on toasted italian roll with marinara sauce for dipping. Homemade italian sausage link topped with sautéed peppers and sweet onions and melted provolone. Toasted foccacia piled high with a savory dijon chicken salad. Three tasty meatballs on a crusty roll with marinara and melted provolone. Whole wheat or gluten free pasta for just an extra $2.50. Heavy on the sausage, a house specialty you will eat even when your full. Tubular pasta baked with marinara, italian sausage, bell peppers, onions and mushrooms, then topped with parmesan, mozzarella and pepperoni. Flat pasta ribbons tossed in a creamy, rich and cheesy alfredo sauce. Great with Shrimp or Chicken. 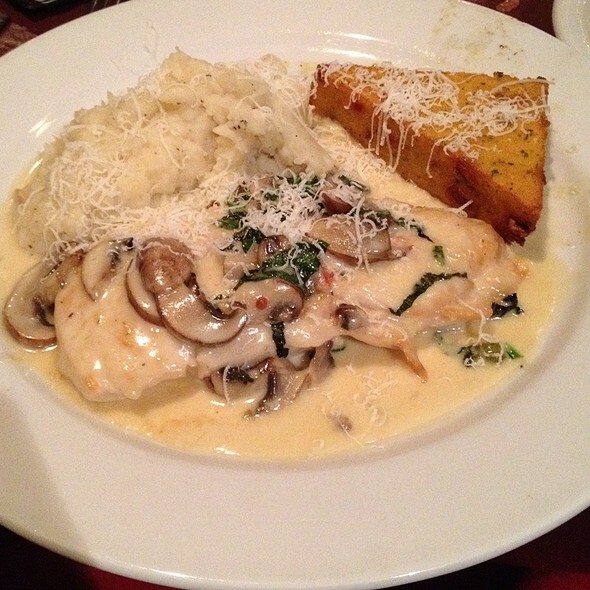 Fresh chicken breast sauteed with crimini mushrooms and basil. Then tossed with fettuccine in a creamy marsala sauce. A bent noodle favorite! Pasta pillows stuffed ricotta, mozzarella and parmesan blend with fresh basil. Served with a roasted red pepper tomato sauce. Tender baby clams, in a spicy garlic broth over linguini. Capicola, a spicy ham, tender snap peas, and diced tomatoes in a roast garlic cream sauce tossed with penne pasta. With: meatballs made from ground chuck. Or sausage made with our own home recipe. Want both? order a Combo. Linguini tossed with fresh garlic (lots of this), fresh basil, parsley, olive oil, a pinch of crushed red pepper and parmesan cheese. Large tubular pasta baked in a slow cooked tomato sauce with creamy mozzarella. Fresh vegetables and herbs lightly sauteed with extra virgin olive oil, white wine, lemon, garlic and a pinch of crushed red pepper, tossed with linguini. Spaghetti tossed with olive oil, garlic, fresh tomatoes, fresh basil and feta cheese. Simple but what flavors! Chicken breast breaded and lightly fried topped with creamy provolone on a bed of marinara sauce with linguini. Oven roasted chicken sauteed with fresh spinach and sun dried tomatoes in a creamy whole grain mustard sauce tossed with penne pasta. 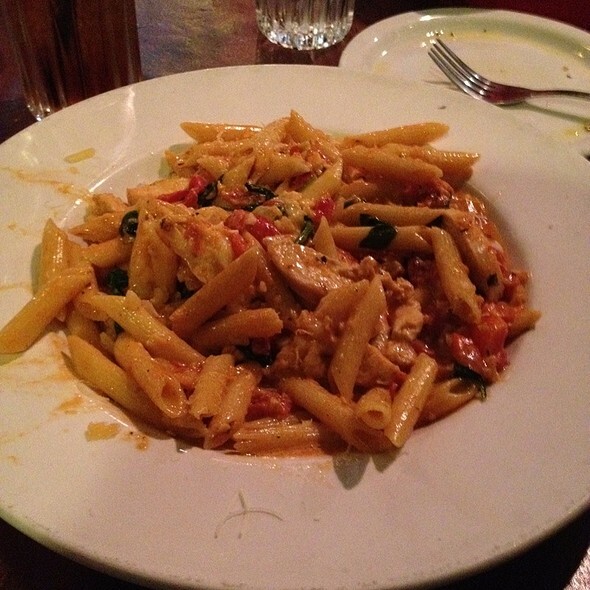 A traditional dish of a creamy vodka tomato sauce tossed with penne. Ltalian sausage sauteed in extra virgin olive oil with cremini mushrooms, sun dried tomatoes, fresh basil, a pinch of crushed red pepper and garlic. With bowtie pasta. Ooh la la. Slow cooked pot roast with mushrooms, carrots and celery with penne pasta. The restaurant was packed which always tell me not all these people can be wrong, it must be good and it was fun. Super appreciate the waiter, he was a big help and did a great job and I can't remember his name. I would go back and try something different. good food ,wine was a modest price . We had a friend in town and took them to Bent Noodle for dinner. Service was great as always and the food was perfect. Our guest ordered a salad with Salmon and the waiter came to tell that the salmon got overcooked and that they were preparing a new dish for them. This shows the care the staff takes to make sure each dinner is prepared correctly and making sure each diner has a great food experience. The salads we ordered were Great!! Waiter was fun and attentive!! I like the crowd that the Bent Noodle gets... older and not rude or rowdy. Prices are moderate, we didnt have to worry about wanting something and it being too pricey! Everyone at the table commented how wonderful everything was. It is nice to come back to a place and have even a better experience than the time before, while most establishments are going the other direction. Italian food is always very good and served in generous portions. The kitchen sent out our entrees prior to salads and our waiter Rob was very nice to immediately remove charges for salads from our ticket. Food at Bent Noodle is so tasty that I won’t let this one mistake deter me from returning. I have eaten here many times and every guest I introduce to Bent Noodle is very complimentary. Food was so good and our waiter was AWESOME!! We'll be going back for sure!! Ordered veal parmegean, Food arrived luke warm. and replaced, arrived hot. Pasta very underdone, difficult to chew. Originally requested veal not be deep fried, but pan sauteed. Waiter checked with cook and confirmed it would be done. When finally received veal was very thick, chewy like rubber bands, and inedible. My partner's chicken parm was burnt on both sides, also inedible. Waiter deducted costs of entrees and offered desert at no cost. We will not be going back there! Great Italian food....the 'basics' and more. Excellent service. I ordered the wrong thing ...my mistake and they did everything they could to fix that. Offered to box the incorrect order and bring me the one I meant to order. I didn't want them to do that ....and the incorrect one was great. They still brought me a small portion of the other. Way above and beyond. We loved everything about our date night here! The warm bread to dip in olive oil, the fresh and yummy salads, delicious Chicken Piccata and Veal Parmesan, and bread pudding to die for! Had reservations for 5:00 on Saturday the 9th of March. Restaurant was NOT busy at all. It was hard to get our servers attention. It took forever to be waited on. Our server seemed 'put out'. The food was average at best. We will never ever go there again. I wasn’t really impressed by anything. The Fettuccine Alfredo was rather bland and didn’t have much flavor. The sausage and the garlic cheese bread were the best things there. Waited about 10-15 minutes for a drink refill. Was never asked if we wanted dessert. Wouldn’t go back, even with another Groupon. Came for wife’s birthday. We love this place! Great food and service!!! Our waitress, Nicole was outstanding. they also seated us in a booth in a quiet section of the restaurant as we had a couple of individuals with hearing issues. We were celebrating my husband's birthday with a birthday coupon good for one entree free with the purchase of another entree. The service was great, the food came out quickly and tasted delicious. We will definitely be back. Great food and great service. Will surely go back again and try all the entrees. It was the location of our first date been married five years now! We visit every Valentine's Day! Food and atmosphere were great. Had a little wait even though we had reservations, but it was Valentine's Day. The food portions are large, tasted great and they have a great selection of desserts. Always exceeds expectations!!! I love everything about this restaurant! Took the family there for a Birthday dinner. Everything was excellent, on time and served hot. Will definitely be back. Absolutely loved our meals. Fresh and cooked to perfection. Alec and staff were terrific. My friend and I asked for a slow, relaxing evening on a Wednesday and Alec gave us plenty of time to talk and catch up without pressure to order. He made sure to stop by to keep drinks filled and provide a smile. The food tasted great! A very enjoyable night! Nice experience - food was very good. Everyone at the table remarked that their food was very good. We love this place. We have started to find our favorites. Need to venture out and try some of the other outstanding dishes that they have here. The only drawback was that we were seated close to the exit door and got a blast of cold air everytime someone left. They should think about adding a wall or screen to block the cold. We left earlier than we planned because it became too uncomfortable. Awesome server and great food ! Made my birthday celebration wonderful! Great place we come here a several times a year. Our only complaint is the draft from the door opening....brrr - not cozy. This reservation was for Christmas Eve and when I called to add a guest they said I couldn't have a reservation because they were closing at 7pm that night. So I can't really give a review. Baked ziti is fabulous. Skip the desserts. Great selection of tasty Italian apps and main dishes. Timely service. Attractive decor. Moderately priced for good value. The Bent Noodle is usually one of our favorite restaurants. However, this visit was a disaster. We waited 20 minutes before a server even brought us water. And then we had to keep asking for more, because they couldn’t get it right. The service continued to be slow. We waited 35 minutes before any bread was served and our order taken. The music was so loud we couldn’t converse. It was my daughters birthday. As I stated on our reservation form. I requested a dessert, and obviously, staff hadn’t even looked at my request. We had no dessert, and went elsewhere for one. To be fair. 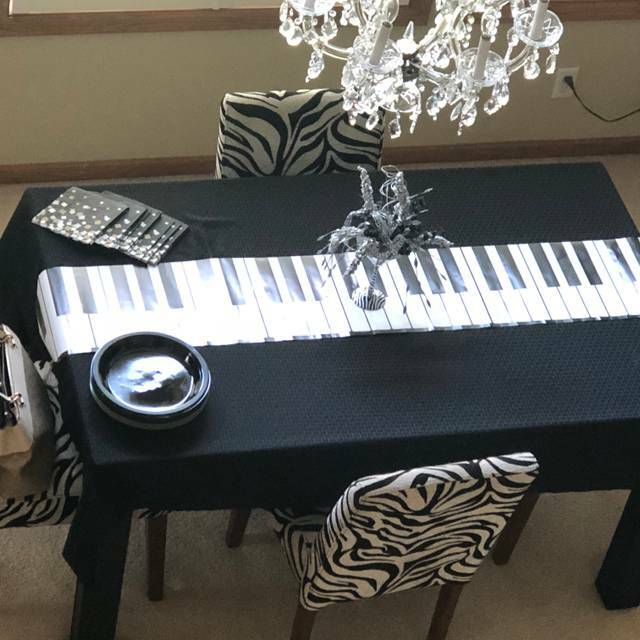 The restaurant does not have music every night. Usually it is cozy, and the service is excellent. But, this visit was the wrong night to be, in the wrong place. The lack of service was unacceptable. The service was friendly and prompt. The food was very tasty with all flavors blending beautifully. Bent Noodle is a favorite of ours. Great food and service! Food was very good. Our waiter (Alec) was absolutely terrific. 1) when we arrived, with an Open Table reservation, we asked the host for one of the three booths that were open. He gruffly said, “No, they are all reserved.” However, when we left, after eating our dinner, those three booths and one additional were all still unoccupied. Disappointing! 2)we ordered and were served a “Chianti Classico” from the menu. It’s was just “OK”; halfway through the bottle I looked more closely, and, while the label said “Chianti Classico”, there was no gallo nero, so it was a fake. This restaurant should be careful about this!